posted by Lisa Ace in Sponosred post, adverrtisement, Reliant Real Estate, Homes for Sale, listings, Lynn Bezon, Oakfield..
Super solid country home in the middle of fields-beautiful location! Outside landscaping is beautiful in spring, summer and fall with endless perennial flowers and pretty patio to sit and enjoy! Inside is super homey and waiting for the next owners updates! Extra large room sizes and storage galore. Oversized back sun room with pretty tongue and groove woodwork and lots of sliding doors to welcome the breezes and also includes propane stove to carry it into the colder months. Inside features country kitchen with laundry nook, spacious dining area and cozy living room with beautiful stone wall propane fireplace. There is a large newer 1st floor master bedroom and oversized first floor bath as well as two bedrooms upstairs. Easy to see! Call Lynn Bezon today at 344-HOME or click here for more inforamtion on this listing. posted by Lisa Ace in Sponosred post, adverrtisement, Reliant Real Estate, Homes for Sale, listings, Lynn Bezon, Oakfield. posted by Lisa Ace in Sponsored Post, advertisement, Reliant Real Estate, Lynn Bezon, Homes for Sale, genesee county. posted by Lisa Ace in Sponsored Post, advertisement, Reliant Real Estate, Happy Thanksgiving, Lynn Bezon, real estate, Perfect Home. posted by Lisa Ace in Sponsored Post, advertisement, Reliant Real Estate, Lynn Bezon, batavia.. Owner says SELL this solid 5 bedroom, 3 full bath home in move in condition on 1.5 acres! You cant find to many like this! This well laid out spacious home has something for everybody -- a newly redone and pretty kitchen with granite countertops, large dining area for friends and family, five good-sized bedrooms well spaced out to give everyone privacy. Three FULL baths-you can never have enough seats! When you walk in you are welcomed into awesome foyer/sitting room with beautiful wet bar and fireplace with vaulted ceiling leading to two loft-style bedrooms -- perfect for guests or his and her offices! All mechanical updates are in good working order and all appliances included! Located in the town with 1.5 acres and minutes from thruway for easy commutes to everywhere! Call Lynn Bezon to see this listing or click here for more information. posted by Lisa Ace in Sponsored Post, advertisement, Reliant Real Estate, batavia, city, Lynn Bezon. 164 Summit St., Batavia -- Comfortable and solid City colonial in nice neighborhood. Easy to see and super affordable -- this 3 bedroom, bath and a half home features very spacious room sizes. Mechanically sound with nothing urgent to tackle but what you want to do! Enjoy the front porch that has the Trex decking to enjoy the neighborhood. Or have your morning coffee on the back deck to enjoy the peacefulness of the cute backyard, either way come check out a really nice home! Click here for more information on this listing or call Lynn Bezon today! posted by Lisa Ace in Sponsored Post, advertisement, Reliant Real Estate, Lynn Bezon, batavia. Owner says SELL this solid 5 bedroom,3 full bath home in move in condition! You cant find to many like this! This well laid out spacious home has something for everybody - a newly redone and pretty kitchen with granite countertops, large dining area for friends and family, 5 good sized bedrooms well spaced out to give everyone privacy. Three FULL baths-you can never have enough seats! When you walk in you are welcomed into awesome foyer/sitting room with beautiful wet bar and fireplace with vaulted ceiling leading to 2 loft style bedrooms-perfect for guests or his and her offices! All mechanical updates are in good working order and all appliances included! Located in the town with 1.5 acres and minutes from thruway for easy commutes to everywhere! Call Lynn Bezon to see this listing or click here for more information. posted by Lisa Ace in Sponsored Post, advertisement, Reliant Real Estate, Lynn Bezon, batavia, open house. 147 PEARL STREET, BATAVIA OPEN HOUSE - SATURDAY 11 a.m. - 12:30 p.m. Amazing house for the money so many upgrades & improvements for the money you won’t find more for less-see for yourself -- easy to see at a moment's notice! Solid 3 bedroom, bath and a half home. Completely remodeled within the last 5 years, beautifully done and nothing for you to do but enjoy! Full tear off roof 4 yrs ago. Beautiful cherry cabinetry with granite countertops and all stainless appliances to stay plus washer/dryer! Extra large family/dining area perfect for entertaining with pretty gas fireplace. Super convenient upstairs laundry and 3 large bedrooms. All new carpeting thru out! Outside features extra wide drive and double lot with great deck-inexpensive utilities and NO flood insurance! SO MUCH BANG FOR THE BUCK AND EASY TO SEE AT MOMENT NOTICE! BE IN BEFORE THE HOLIDAYS! Call Lynn Bezon today – 344-HOME to see this HOT BUY or click here to view the full listing. 8009 Bank Street Road, Batavia – $249,900 – Click here to view this listing. 164 Summit Street, Batavia – $117,900 – Click here to view this listing. 6800 Junction Road, Pavilion – $129,900 – Click here to view this listing. posted by Lisa Ace in Sponosred post, advertisement, Reliant Real Estate, Lynn Bezon, Alabama, town of batavia, House for sale, real estate. 7051 MAPLE ROAD, ALABAMA -- Solid spacious and super homey is what you will find with this country charmer! 3 bedroom two full bath home with great layout and many upgrades. Home features spacious room sizes large living room and cozy family room with wood burning stove and sliding door outlooking pretty stamped concrete patio and great yard! New electric service, hot water tank and 5-year-old propane furnace and central air! Full bath on both floors and first floor laundry being completed makes for extra convenience for all! Located on almost 1.5 acres there is storage galore. Large 2 car garage that is heated and ready for hanging out and puttering around-then there is a large handy shed for outside supplies AND a large two story barn/workshop with loft and electric for all the other toys! Check it out, call Lynn Bezon now or CLICK HERE for more information on this listing. 3207 PRATT ROAD, BATAVIA (TOWN) LOT #30 -- Super clean with tons of upgrades, do not let this one go unnoticed! Home has 3 bedrooms and 2 full baths, large living room and super homey kitchen with all stainless appliances included, as well as washer and dryer. New flooring throughout -- nothing to be done here! Newer hot water tank and central air and approximately 8year-old roof. Home has doublewide blacktop driveway, attached garage and nice back deck overlooking super deep and private back yard with 2 sheds that also have electric run to them! Easy to see! Call Lynn Bezon now or CLICK HERE for more information on this listing. posted by Lisa Ace in Sponsored Post, advertisement, Reliant Real Estate, Lynn Bezon, New Home, real estate. 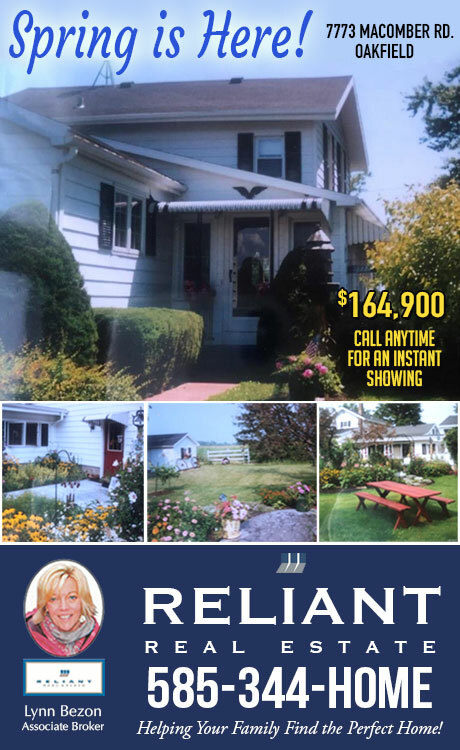 posted by Lisa Ace in Sponsored Post, advertisement, Reliant Real Estate, batavia, Pavilion, Lynn Bezon, open house. 164 Summit St., Batavia, 11 a.m. - 12:30 p.m. Comfortable and solid City colonial in nice neighborhood. Easy to see and super affordable! This 3 bedroom, bath and a half home features very spacious room sizes, downstairs is open and great for entertaining but very homey. Some hardwood floors and gorgeous unpainted woodwork really give this home charm. Upstairs bedrooms are all large with closets and attic is already partially finished and with a little paint could be amazing extra living/play space! Mechanically sound with nothing urgent to tackle but what you want to do! Enjoy the front porch that has the forever trexx decking to enjoy the neighborhood or have your morning coffee on the back deck to enjoy the peacefulness of the cute back yard-either way come check out a really nice home! Call Lynn Bezon today to see this listing or click here for more information. 147 Pearl Street Road, Batavia, 1 - 2:30 p.m. Solidly maintained 3 bedroom bath and a half home! Completely gutted and remodeled within the last 5 years --beautifully done and nothing for you to do but enjoy! Full tear off roof 4 yrs ago Beautiful cherry cabinetry with granite countertops and all stainless appliances to stay plus washer/dryer! Extra large family/dining area perfect for entertaining with pretty gas fireplace! Super convenient upstairs laundry and 3 large bedrooms. All new carpeting thru out! Outside features extra wide drive and double lot with great deck -- inexpensive utilities and NO flood insurance! SO MUCH BANG FOR THE BUCK AND EASY TO SEE AT MOMENT NOTICE! BE IN BEFORE THE HOLIDAYS! Call Lynn Bezon today to see this listing or click here for more information. posted by Lisa Ace in Sponsored Post, advertisement, Reliant Real Estate, batavia, Pavilion, Lynn Bezon, Homes for Sale. 8009 Bank Street Road, Batavia. Looking for space? Then look no further! Check out this solid 5 bedroom, 3 full bath home in move in condition! This well laid out spacious home has something for everybody – a newly redone and pretty kitchen with granite countertops, large dining area for friends & family, 5 good-sized bedrooms well spaced out to give everyone privacy and 3 FULL baths! You can never have enough seats! When you walk in, you are welcomed into awesome foyer/sitting room with beautiful wet bar and fireplace with vaulted ceiling and leading to a two loft style bedrooms – perfect for guests or his and her offices! All mechanical updates are in good working order and all appliances included! Last but definitely not least, LOCATION -- located in the town with 1.5 acres and minutes from Thruway for easy commutes to everywhere! Call Lynn Bezon today to see this listing or click here for more information. 6800 Junction Road, Pavilion. Super solid, move in ready, raised ranch home on quiet 1/2 acre country lot! Move in and enjoy no honey do lists on this 3 bedroom 2 full bath home. Downstairs features large family room with gas fireplace pretty ceramic floors, brand new full bath -- perfect hang out room or an awesome large master bedroom suite! Upstairs features hardwood floors large open kitchen/dining/living space ideal for entertaining! Three bedrooms with full closets and another brand new bath-not a lot to do here but decorate! Outside is nicely landscaped and lot backs up to fields with pretty views -- very easy to see! Call Lynn Bezon today to see this listing or click here for more information. posted by Lisa Ace in Sponsored Post, advertisement, Reliant Real Estate, batavia, Lynn Bezon. Looking for space? Then look no further, check out this solid 5 bedroom, 3 full bath home in move in condition! This well laid out spacious home has something for everybody: a newly redone and pretty kitchen with granite countertops; large dining area for friends & family; 5 good sized bedrooms well spaced out to give everyone privacy; and 3 FULL baths -- you can never have enough seats! When you walk in you are welcomed into awesome foyer/sitting room with beautiful wet bar and fireplace with vaulted ceiling, and leading to 2 loft style bedrooms -- perfect for guests or his and her offices! All mechanical updates are in good working order and all appliances included! Last but definitely not least LOCATION -- located in the town with 1.5 acres and minutes from the Thruway for easy commutes to everywhere! Call Lynn Bezon at Reliant Real Estate today or click here for more information on this listing. posted by Lisa Ace in Sponsored Post, advertisement, Reliant Real Estate, batavia, Alabama, Homes for Sale, real estate, New Home, Lynn Bezon. 164 Summit St., Batavia. Comfortable and solid City colonial in nice neighborhood. Easy to see and super affordable, this 3 bedroom bath and 1 a half home features very spacious room sizes. Downstairs is open and great for entertaining but very homey. Some hardwood floors and gorgeous unpainted woodwork really give this home charm. Upstairs bedrooms are all large with closets and attic is already partially finished and with a little paint could be amazing extra living/play space! Mechanically sound with nothing urgent to tackle but what you want to do! Enjoy the front porch, that has the forever Trexx decking to enjoy the neighborhood or have your morning coffee on the back deck to enjoy the peacefulness of the cute back yard – either way come check out a really nice home! Call Lynn Bezon at Reliant Real Estate today 344-HOME for more information or click here to view the complete listing. 147 Pearl Street Road, Batavia. Superbly maintained 3 bedroom bath and a half home with not one ounce of anything to do! This home is no flip...completely gutted and remodeled within the last 5 years, beautifully done and tastefully decorated. Roof full tear off 4 yrs. ago, furnace 5 yrs. Beautiful cherry cabinetry with granite countertops, all stainless appliances to stay. plus washer/dryer! Nice formal dining with extra large living room area with cozy gas fireplace–great for entertaining. Upstairs bath fully gutted with super convenient upstairs laundry area and three large bedrooms. All new carpeting throughout as well! Outside features an extra wide drive and double lot and nice back deck...Inexpensive utilities and no flood insurance, what more do you want? Call Lynn Bezon at Reliant Real Estate today 344-HOME for more information or click here for more details on this listing. 2176 Judge Road, Alabama. Solid home for the money! Opportunity is here for someone looking to do a little work to get their reward. Roof, furnace, hot water tank, vinyl siding updated since 2000+ 200 amp electrical system and newly installed public water. Rooms are decent sized, 1st floor bedroom if needed - mud room/first floor laundry a bonus! Garage is useable and back yard is deep-easy to check out anytime! Call Lynn Bezon at Reliant Real Estate today 344-HOME for more information or click here for more details on this listing.